Forward Day by Day is a booklet of daily inspirational meditations reflecting on a specific Bible passage, chosen from the daily lectionary readings as listed in the Revised Common Lectionary or the Daily Office from the Episcopal Church's Book of Common Prayer. The meditations are rich in substance and offer a wide range of witness and experiences. Each month’s meditation is written by a different author. Inspiring readers since our first issue was published in 1935, Forward Day by Day remains a significant resource for daily prayer and Bible study to more than a half million readers worldwide. Order a single copy for yourself, or give a gift subscription to a loved one. 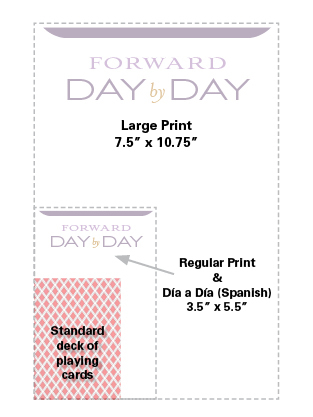 Forward Day by Day is also available in bulk as a Standing Order for those who wish to purchase quantities of ten or more copies of each issue. Click here to view a PDF sizing chart of print editions.  Follow Forward Day by Day on Facebook and Twitter, and don't forget to follow Forward Movement for updates on all our publications and resources. All prices listed are in USD only. Two-year print subscriptions include 8 quarterly issues, mailed one month before each quarter begins. See the schedule above for delivery timelines. Start receiving emails within a few days. Expect a short delay over holidays and weekends. Click here to renew a subscription. Standing orders are for at least 10 copies of the same issue sent to the same address.